What’s the most common mineral on Earth? Is it quartz, limestone? Maybe olivine? Well, if you take into consideration the entire planet, the most common mineral would be something known as silicate-perovskite – but now, that mineral finally has a name. A sample of the 4.5 billion-year-old Tenham meteorite that contains submicrometer-sized crystals of bridgmanite. Yes, it’s that really small thing. On June 2, bridgmanite was approved as the formal name for silicate-perovskite – possibly of the Earth’s most plentiful yet elusive mineral known to exist in the Earth’s lower mantle, between 670 and 2,900 kilometers (416 and1,802 miles). . The name was given in honor of 1946 Nobel Prize winning physicist Percy Bridgman, honoring his researches concerning the effects of high pressures on materials and their thermodynamic behaviour. You won’t find any bridgmanite on the surface, as the mineral naturally exists only in the lower part of the mantle (which is made 93% from it). Scientists have known (or had very strong theories regarding its existence) for decades, but were unable to find a surface sample, until this year. “This [find] fills a vexing gap in the taxonomy of minerals,” Oliver Tschauner, an associate research professor at the University of Nevada-Las Vegas who characterized the mineral, said in an email. Tschauner worked with his colleague, Chi Ma, a senior scientist and mineralogist at the California Institute of Technology in Pasadena, Calif., to characterize the structure of silicate-perovskite since 2009. However, this year they made a big breakthrough, after analyzing a meteorite which fell in Australia in 1879. The meteorite formed 4.5 billion years ago, and was “highly shocked”. “Shocked meteorites are the only accessible source of natural specimens of minerals that we know to be rock-forming in the transition zone of the Earth,” said Tschauner. 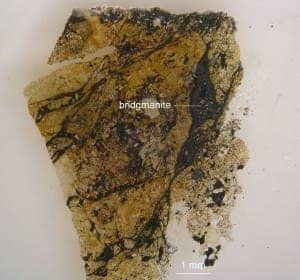 After throughly analyzing it with every available technique, they were finally able to find the bridgmanite veins in the meteorite. Thus, confirming decades of research, they were also able to submit an official name for the mineral, which they did in March 2014.